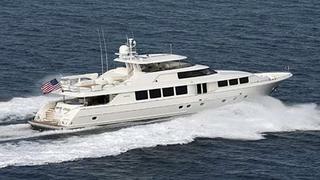 That's 18 sales in May as Bob Cury at RJC Yachts tells me Raymond Young has sold the 34m Westport motor yacht Kassidy Lynn with Chris Daves at Denison and Daves bringing the buyer. Launched in 2009, she’s the most highly customised Westport 112 built to date. Her custom Robin Rose interior features several upgrades including cherry joinery, onyx stonework and newly designed improvements to her layout. With only 1300 hours on her MTU/DDC 16V-2000 engines, she sleeps eight guests in four staterooms. Kassidy Lynn was asking $8,495,000.